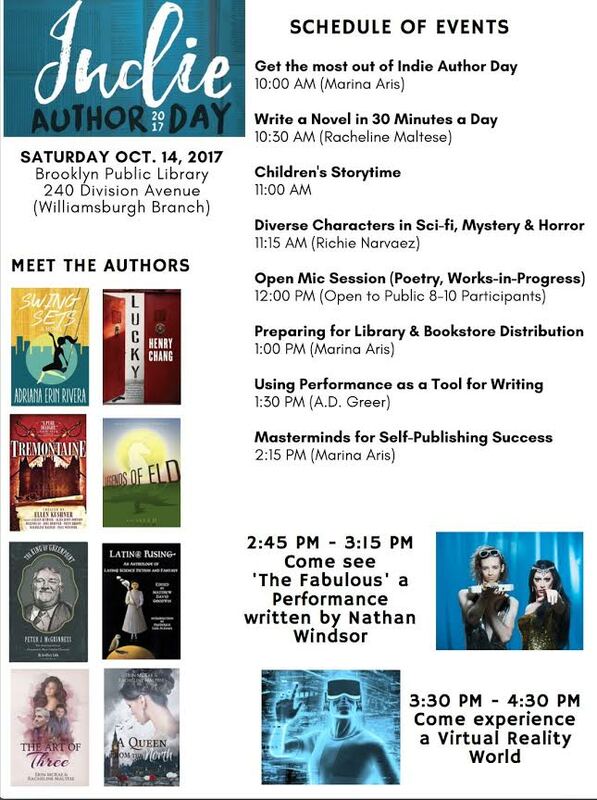 On Saturday, October 14, I’ll be participating in Indie Author Day at the Williamsburgh Public Library, 240 Division Avenue, in Williamsburg, Brooklyn. That’s the library where I used to research my reports in sixth grade and junior high. I haven’t been back since, so this should be nostalgic. Or rage-inducing. Williamsburg does both for me. I’ll be doing a brief workshop on “Writing Diverse Characters in Sci-fi, Mystery & Horror” at 11:15 a.m., reading from Roachkiller and Other Stories during the open mic, and then I’ll be hawking some books, mostly copies of Latin@ Rising. Come see me and some of my excellent author pals, including Lucky Henry Chang and Auspicious Adriana Erin Rivera (Swing Sets).